The split album seems to be in vogue again, and it’s a format which perhaps offers more scope for artists who don’t trade in punchy little tunes than the split single or EP. Shine on you Crazy Diagram may only contain four tracks and have a running time of just over thirty minutes, but it allows both contributing acts to showcase the range of their sound by presenting expanded, developed musical works. 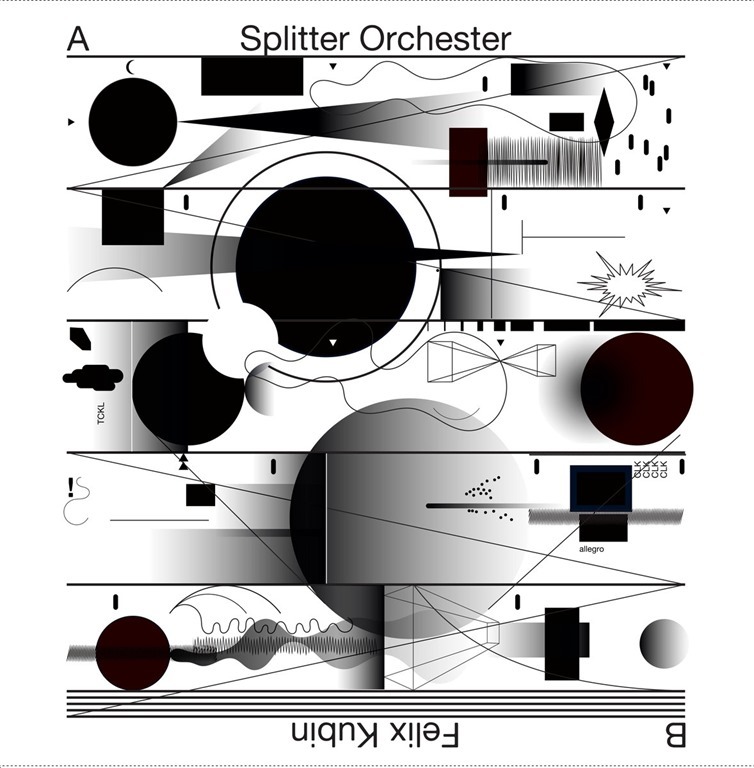 The two tracks by Splitter Orchestra explore and examine weird digital percussion: the ever-shifting pitch creates the illusion of ever-shifting tempo (or does it? Perhaps the tempo does shift albeit subtly) beneath whistling contrails of feedback. They sputter and scrape and drone and hum. ‘Diagram 1’, at under four and a half minutes, is but a prelude to its counterpart, ‘Diagram 2’ which hums and wheezes for almost eleven minutes. There are rhythms in the mix, but they’re pinned back in the mix and bounce around against a shimmering backdrop of feedback and extraneous noise. Kubin’s compositions are altogether less overtly structured, or at least rhythmic, as swampy swashes and thumps rumble and eddy before – from seemingly out of nowhere – faceripping blasts of distortion roar and blast. ‘Lückenschere’ is constructed around a clattering, shifting rhythm. ‘Lichtsplitter’ clatters and moans and hums and drones for an eternity, before stepping up about ten gars. By the end, one has a fair idea of what it just be like to stand within two feet of a Boeing 474 taking off. This is, without doubt, one of those releases which lends itself perfectly to vinyl: it is, after all, an album of two halves. They compliment and contrast, and showcase two quite different sides of the experimental digital coin. There’s a digital bonus track from the Splitter Orchester. ‘Diagram 3’ is a ten-minute extravaganza of thick, impenetrable hums and drones. It might not exactly change the complexion of the release, but it does unquestionably fill out and round off the intangible, non-physical format nicely.